October 26th – Rebecca Moyes, M.Ed. Come and learn practical strategies for school and home that will empower your student to succeed, while capitalizing on his/her strengths. Students on the autism spectrum and those with behavioral challenges often present with difficulty regulating their feelings and interacting socially. This workshop describes how to handle meltdowns and design effective behavior plans to prevent these moments and reduce frustration and anxiety. The second part of the presentation details strategies to motivate students to learn, ways to teach social skills, how to generalize skills into the natural setting and increase acceptance and tolerance from peers. Information will be imparted though lecture, interactive exercises, and video clips. 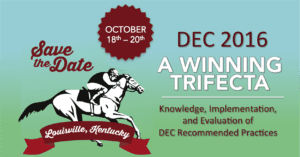 We look forward to seeing you at the 32nd Annual International DEC Conference in Louisville, Kentucky. This year’s conference theme, “A Winning Trifecta: Knowledge, Implementation, and Evaluation of DEC Recommended Practices,” features leading experts from around the world in early intervention, early childhood special education, and related disciplines. Our conference program is designed to develop the skills and knowledge of those who work with or on behalf of young children with special needs and their families. If you have any questions about the DEC Conference, please feel free to contact us at conference@dec-sped.org. With the demand for autism experts and autism therapists on the rise, it is more important than ever for teachers and health professionals to have some form of ASD training. At IBCCES, we are committed to providing professional development training through our Autism Certification. Since 1965, the Autism Society has embraced its mission to make a better world for all with autism. Shortly after its founding, the Autism Society held an inaugural national conference to discuss the state of children with ASD in America. This meeting brought together parents of children with ASD to share resources, experiences and develop strategies to be effective advocates for their children.